17 Medals for WWG at Baskervilles and The Spark! 13 WWG gymnasts competed at The Spark competition (Floor, Vault and Range) and Baskervilles (Floor, Vault and Trampette) on Sunday 16th October, and achieved 17 medal placings between them. 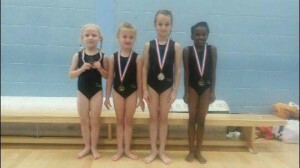 Gymnasts at The Spark competition were Cora Fievez, Maisie Bridgman, Erica Sheppard and Kayla Thomas. 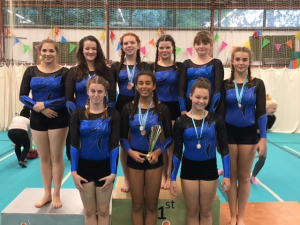 The gymnasts who competed at Baskervilles were Kirsty Mellen, Molly Howarth, Lottie Howarth, Clara Howison, Lauren Scott, Morgan Francis, Tara Hollister, Bethany Edwards and Phoebe Bygrave. Well done to all the gymnasts: a fantastic achievement. A special congratulations to Molly Howarth for achieveing Gold in the Over 13 Intermediate, and Kirsty Mellen who will now be retiring (at the age of 18) to coach the next generation of WWG gymnasts!